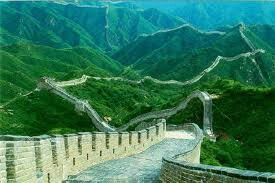 The Great Wall of China is one of the New Wonders of the World. It is over 5,500 miles in length, 20-25 feet high and 12-15 feet wide, stretching from Shanhaiguan in the east to Lop Lake in the west. The wall was constructed of a series of stone and earthen fortifications in northern China served as a major defense against the invasion of the Huns. Several walls have been built since the 5th century BC that are referred to collectively as the Great Wall, which has been rebuilt and maintained from the 5th century BC through the 16th century.